Kenyan rapper Noti Flow is back to her usual naughtiness, this time after sharing a video which captured her sharing a steamy kiss with her ex-boyfriend Colonel Mustapha. In the video posted on Instagram the two artistes appear to be having an intimate moment at the back of a car. Mustapha has one hand on Noti's exposed thigh. He then proceeds to give an open mouth kiss to the Notire hit maker. The kiss goes on for a few seconds with Mustapha seemingly not getting enough of it. "Well, in my defence I was expecting a peck," Noti Flow captioned the video. The two used to be an item before their dramatic break up last year. 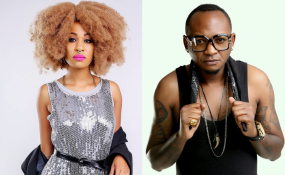 Their relationship blossomed while they were working together on set as co-cast in the local reality TV show Nairobi Diaries. Noti accused Mustapha of sleeping around while he was still in a relationship with her. "Wonders shall never end," Freshirwa commented. "On boy child's defence I see we were expecting a peck but you upgraded it," Bablezbernard wrote. "Whaaaat... notiflow and uncle Mus!!! Indeed, no one should try and separate what God has joined together," Leahrose commented. "Baby @notiflowbasata bora hamna huku kwetu raha," Doracate said.